(IV) Archetyp Berlin Now, Loop, Rotationsrichtung, 31, 32 Umdrehungen/min. (XIII) Archetyp Berlin Now, Loop, Rotationsrichtung, 8, 9 Umdrehungen/min. David Nolan Gallery is pleased to announce Jorinde Voigt’s first exhibition in the United States. 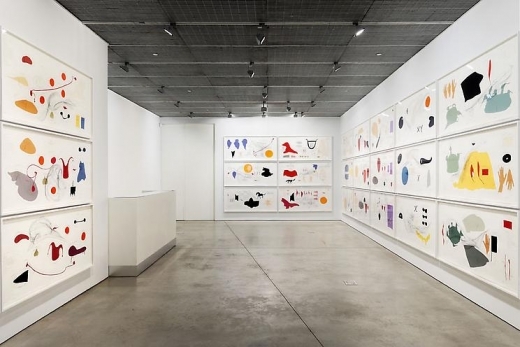 The exhibition will feature drawings from 2008 to 2012, and two sculptural installations. 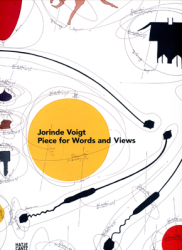 The works of Jorinde Voigt (b. 1976, German) present a unique visual language representing algorithmic systems composed of objective and subjective elements. Aiming to make the invisible visible, Voigt reveals the complex world in which we live, a world permeated by complementary, overlapping, and conflicting forces. 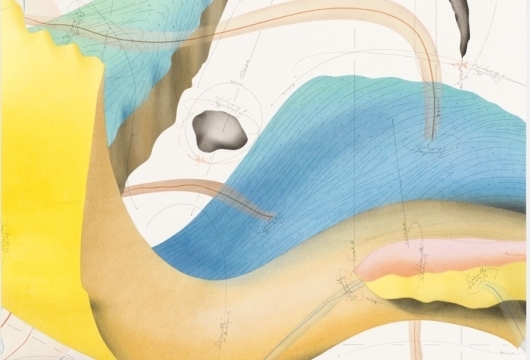 Music, weather, geography, literature, and philosophy are among the subjects that inspire Voigt’s lyrical drawings, all of which she renders into a dizzying maelstrom of lines and notations as one thought is linked to the next. The characteristics of the concepts themselves often inform the way Voigt chooses to represent them on paper. 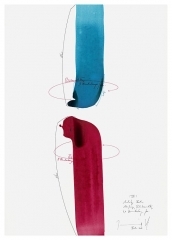 In her Küssen (Kissing) drawings, the notations fan out of a central point, resembling the gesture of a blown kiss. 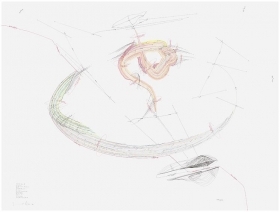 Voigt constructs compositions that are unmistakably representative of musical scores in her Symphonic Areas series, and she renders measures of rotations and frequency in circular wave-like diagrams. The earliest series presented in the exhibition is STAAT/Random (State/Random) from 2008. It consists of eleven diptychs where Voigt investigates the relationship between variables that seem to have little in common, such as an eagle’s flight path, kissing, and acoustic pulses. 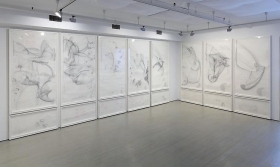 Voigt forms relationships among them through a combination of sweeping, gestural lines representing the flight of a bird through the air and carefully measured notations drawn with a compass or straight-edge to denote quantitative data such as temperature changes and cardinal directions (N, S, E, W). There is always a duality to Voigt’s process: order and chaos, lines hand-drawn versus mechanically rendered, quantitative versus qualitative analyses, objective and subjective realities. Sculptures representing systems of thought through coding, inscription, and movement will also be on view in this exhibition. From 2009 to 2010, Voigt visited botanic gardens in every city to which she traveled and became fascinated by the efforts made to identify, class, and display plants. Voigt created an algorithm by which to represent the characteristics of the plants, such as color and height, and produced a series of sculptures entitled Botanic Code consisting of bands of painted aluminum rods that lean against a wall. With Botanic Code, Voigt translates her sensorial experience into visual code. 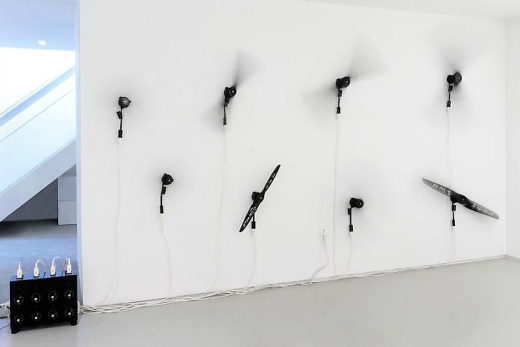 In the series entitled Grammar (2010), sixty-four airplane propellers in groups of eight are inscribed with combinations of phrases conjugating the German verb lieben (to love). They turn at different speeds and in varying directions, linking motion and time to the structure of language. Works from both series will be on view. Roland Barthes’ famous book, “A Lover’s Discourse: Fragments” inspired Voigt to create a series of 36 collaged drawings entitled, “Piece for Words and Views” (2012). Each drawing contains collage elements cut to represent words and ideas in Barthes’ book, thus recreating the central tenets of semiotics: signifier and signified. These representations are then linked to elements such as melody, rotation speed, and a new elaboration of the concept of time: the day before yesterday, yesterday, today, tomorrow, the day after tomorrow → ∞, repeat/year. We will be presenting “Piece for Words and Views” as well as another series of small drawings called Archetyp (Archetype) Berlin (2012). Minimalist and Conceptual artists have approached art by beginning with preconceived guidelines and rules: Hanne Darboven, through the accumulation of numbers and generic notations presented in algorithmic patterns, and Sol Lewitt, through the articulation of mathematical permutations and procedural parameters for his geometric works to be executed by others. 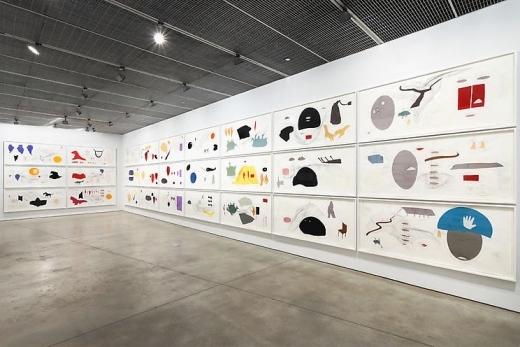 What sets Voigt apart from the legacy left by this generation of artists is her ability to present moments during which her inner world (experiences, emotions, memories) engages with the outside world, rendered as complex pictorial spaces that come together in a marvelous symphony of forms and ideas. Jorinde Voigt was born in Frankfurt, Germany and currently lives in Berlin. 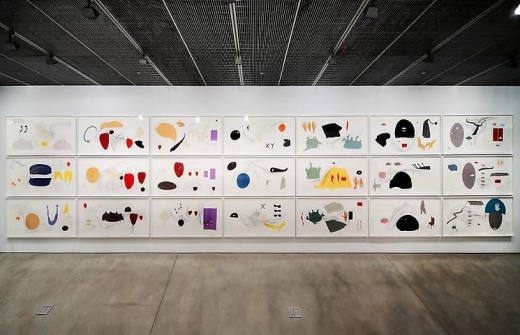 The Museum of Modern Art, New York and the Musée d’art moderne du Centre Pompidou in Paris have recently acquired Voigt’s work for their collections. 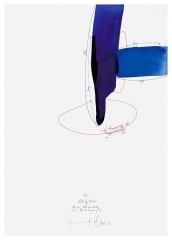 She is one of three nominees for the annual Drawing Prize given by the Fondation Daniel et Florence Guerlain in Paris. Currently, Voigt is featured in a two-person exhibition with Gregor Hildebrandt at the Museum Van Bommel van Dam, in The Netherlands, and has had solo exhibitions at the NKV Nassauischer Kunstverein, Wiesbaden, Germany, Gemeentemuseum, The Hague, Netherlands, and the Von der Heydt-Museum, Wuppertal, Germany.